PangoBright is a free "screen dimmer" Windows utility for setting the brightness of your main screen as well as external monitors. You can choose which screens will be set to the selected brightness level. PangoBright is small (the EXE is around 100K bytes), and is easy on your processor. It has one job, and one job only: to dim your screen(s). You can get PangoBright for free from our download page. It works on Windows 7, Vista and XP. After installation, PangoBright sits in the System Tray at the bottom right of your Windows screen. Just click on the red "P" logo, and the PangoBright pop-up menu appears. Scroll down to your desired brightness level and click. That's it! If you have multiple monitors connected, the pop-up menu will list each monitor, and you can indicate which monitor or monitors to affect. Pangolin produces world-class, award-winning products for laser shows, SMS texting displays, and video signage. These often are used in darkened environments where bright screens are distracting. Our clients asked us for help. We couldn't find any PC software for dimming all windows on the screen (including system dialog boxes), for multiple monitors. So we went ahead and developed PangoBright to solve the problem. Our clients found it so useful, that we're now releasing it to everyone for free! If you like PangoBright, we hope you'll look into our other fine products. Laser shows: Make the world's best laser light shows, with the Lasershow Designer series of software and hardware. It is used by more pros worldwide, and has won more awards, than any other. 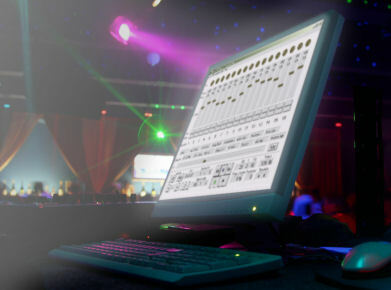 SMS text to screen displays: Network-quality displays for TV shows, nightclubs, DJs, churches and meetings. Easy to configure; works with your own mobile phone. Show text messages, SMS voting results and ads. Video signage: Make your own vidsigns in minutes. Arrange panels that can show videos, photos, advertisements, scrolling and non-moving text, time of day clock, and more. 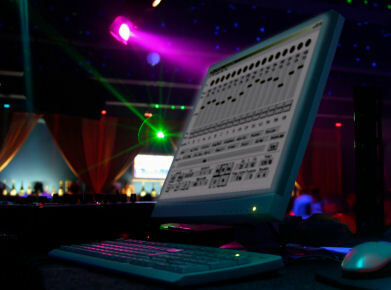 Virtual DJ plug-ins: Essential Flash and Essential Visual plug-ins for Virtual DJ. Play Adobe Flash and arrange borders, pictures, scrolling text, SMS messages, voting and more.